The possibility of a salmonella contamination led Pillsbury’s parent company to recall select batches of the popular brand’s Unbleached All Purpose Flour products, the US Department of Agriculture announced on Twitter on Monday (March 11). Hometown Food Company recalled about 12,000 cases of the flour, which had been shipped to US grocers including Publix and Winn-Dixie supermarkets. But how does salmonella get into flour? We are all accustomed to hearing about salmonella outbreaks in raw poultry or eggs. But salmonella outbreaks in dry foods like flour are not at all uncommon. As we’ve mentioned before, salmonella is one hell of a resilient bacteria group—it will adapt to tolerate whatever stress it is exposed to. If that stress is dry conditions, as is the case with flour manufacturing, the strain will quickly learn to thrive in it. And dry heat “actually makes [salmonella] more persistent in a food or ingredient,” Benjamin Chapman, associate professor and food-safety specialist at North Carolina State University, told Live Science. Adapting to dry heat is also how salmonella ends up in cooked and packaged dry goods like cereals and crackers, as evidenced by the Ritz Cracker and Honey Smacks cereal salmonella recalls of last summer. 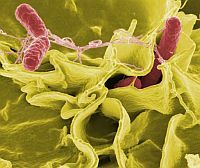 “If salmonella is exposed to dry environments, they are better able to resist heat treatment,” Hendrik Den Bakker, professor at the University of Georgia’s Center for Food Safety, told the site Food Politics. Salmonella is found in animal intestines, and contamination in food often comes from contact with feces. Feces can end up in processed dry-food products through contamination at the processing plant, or in the case of wheat flour, it can be due to the presence of feces in the fields where the grain was grown. “For example, if water used to irrigate a field has animal poop in it, the water can contaminate the food growing in the field,” according to the US Centers for Disease Control and Prevention. This is definitely not the first time salmonella has sparked a flour recall; in January, General Mills issued a nationwide recall of its Gold Medal Unbleached Flour 5-pound bags for salmonella contamination. It issued a similar recall in 2016, too. For now, no illnesses have been announced in connection with the Pillsbury flour, but the USDA is urging people who recently bought Pillsbury flour to check the packaging: If the lot codes on the recalled products are 8 292, with a “best if used by” date of April 19, 2020, or a lot code 8 293 with a “best of used by” date of April 20, 2020, don’t use it. The US Food and Drug Administration hopped on the news to remind people that they shouldn’t be eating raw cookie dough.